Pictured: WIIP members enjoying some networking and sunshine at SOCAP18. From left to right: Grace Stone WG ‘20, Lucas Portela ‘19, and Deborah Chu ‘19. 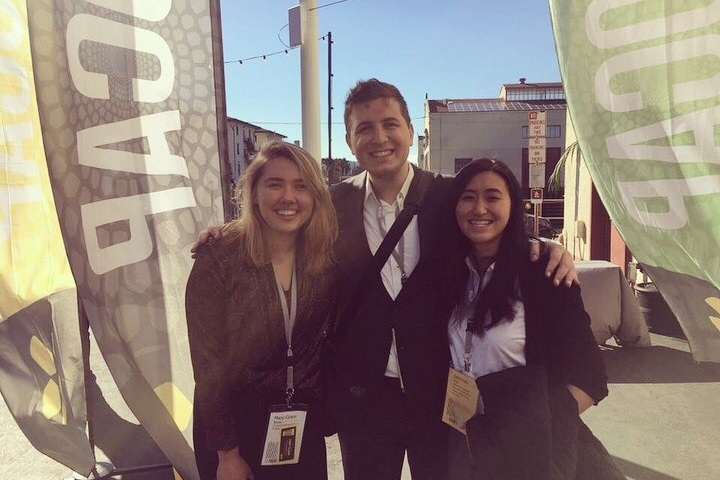 First-year WIIP Associate Grace Stone shares what she and fellow WIIP members learned about trends and themes in the world impact investing from attending the SOCAP (Social Capital Markets) conference in San Francisco. SOCAP 2018 welcomed over 3000 attendees, including individual investors, representatives from the UN, bulge bracket banks, and the development world alike. Here are a few of the themes and lessons learned at SOCAP. Investors at SOCAP2018 sought to understand how an opportunity zone is defined and how the impact community might incentivize investments towards them. Simply put, an opportunity zone is an economically distressed area that is defined by the state. These zones were created under the Tax Cuts and Jobs Act of 2017 in order to incentivize private investments into distressed communities. From the social impact perspective, these tax incentives could entice investors into seeking out opportunities in low-income and underserved neighborhoods. What’s most needed for opportunity zone investments to grow? Impact reporting. Regulations on Opportunity Zones currently do not require impact or data reporting. Clarity on this reporting and measurement would allow for these QOZ funds to make more robust impact claims and garner larger interest and support. What’s next? Opportunity zones seem to offer not only the social impact of uplifting economically distressed communities, but also potentially provide investors with numerous capital gains incentives. However we must explore how to implement an impact reporting system. More information as well as a list of opportunity zones is available through the CDFI. SOCAP also showcased an ongoing conversation around gender lens investing. A key topic at hand was how the term ‘gender lens investing’ itself is used too broadly, entailing not only benefits but also drawbacks. A wide spectrum of gender lens investors, ranging from purely commercial to purely mission-driven, frequently cite this term in making their investments. While this demonstrates huge amount of support, this also brings up the question of what tangibly constitutes women and gender lenses as criteria for investments. A main stage panel on gender lens investing highlighted how investors must all work to take the story of investing in women and girls out of the philanthropic “feel good” bucket and instead transition this thinking into a mainstream investment methodology based around the fact that women are good investments. So, we learned that gender lens investing is an evolving field with all players actively learning and developing that field. Even in the US, only 4% of VC funding currently goes to women. And while total assets in public and private genders-lens products have reached $4.65 Billion, there is still a great deal of work to be done to make this lens mainstream. The World Economic Forum and OECD published a report in 2018 that was the talk of the town at SOCAP. As described in the report, blended finance is a term used to describe the use of public or philanthropic capital to catalyze for-profit private sector investment into projects that advance social or economic well being. This process uses concessionary capital to incentivise return-oriented investments. And the concessionary capital used is defined as “below market cost of capital” (such as grants, political insurance, low interest loans, or first-loss capital facilities). We will have to wait and see how Blended Finance projects play out across investments in 2019. But the potential benefits and new market potential available from this innovation seem to be well worth the experimentation. While these were just a few highlights, SOCAP ‘18 and its attendees showed that impact is going global. Impact investing and the methods and tools for its sustainability and growth are no longer niche, and every year SOCAP attendance is growing due to private and public sector interest. It was a community working to share best practices and partner to invest in impact. It looks like 2019 will be a year for change and innovation in social impact, and we at WIIP can’t wait to be a part of it.